If you are like most, then you aren’t quite sure how to use Twitter ads to generate leads for your business. Just like any paid marketing option, Twitter ads require a different approach for every type of business. Launching a campaign with the wrong strategy can result in wasting the entire advertising budget and not seeing a return. Twitter can be a tricky platform, and while some campaigns will receive a lot of engagement that isn’t going to always result in a return on your investment. Let’s discuss how to leverage Twitter ads correctly and run campaigns that produce returns. A lot of brands will create ads that appear to be doing very well. They will have a lot of engagement, with retweets and favorites. Looks can be very deceiving though, as all of that interaction doesn’t necessarily mean that it is resulting in any leads for the company. When someone favorites your ad they aren’t being added to your list or even leave Twitter to visit your website. While it might contribute a bit to brand awareness, there isn’t a direct ROI that can be measured. In this blog post we aren’t going to discuss engagement or brand building. Most businesses don’t have money to waste on getting their tweets marked as “favorites” and hoping that it eventually helps down the road in some way. Most businesses want direct response lead generation. Prospects that are interested in their product or service at that moment. How do Twitter Ads Work? 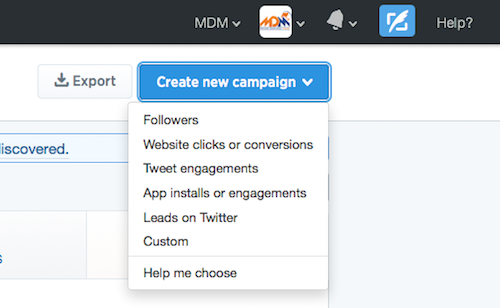 You will first want to click on the “Twitter Ads” option in your main menu. 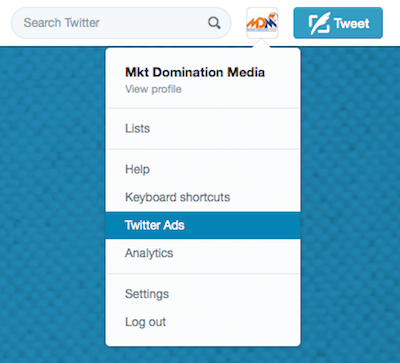 This will direct you to the Twitter Ads dashboard. Under the “Create new campaign” drop down menu it will show you all of the different campaign types you can select from. You can use Twitter ads to attract followers, drive traffic to your website, attract engagement (follows, clicks, retweets, favorites or replies), attract app installs or generate leads. They all have their purpose, but we are going to stick with lead generation. 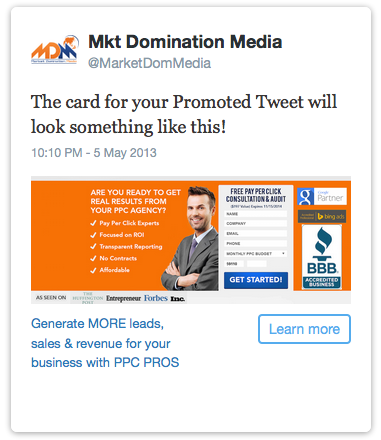 Creating a successful lead generation campaign on Twitter requires that you use laser-focused targeting. Aside from the standard location and language targeting, Twitter allows you to add interests, terms and specific Twitter accounts. Terms and interests can be used if you happen to be in an industry that creates a lot of noise on Twitter. For most businesses the real gold is in the ability to target followers of specific Twitter accounts. 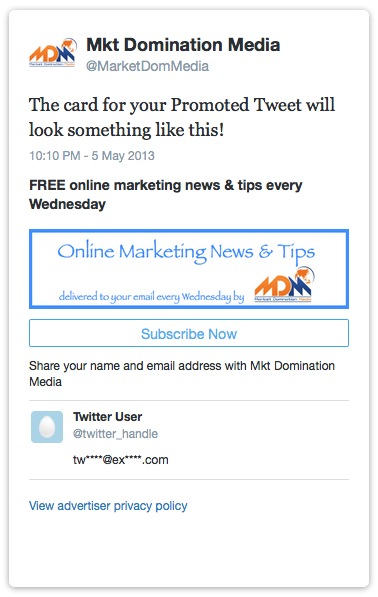 This allows you to present your ad to followers of relevant Twitter accounts. Rather then just add every random Twitter account that you THINK will bring some interest it is much better to focus on only going after accounts that you know will attract converting eyes. Just like an AdWords campaign, the engagement results dictate your cost per engagement. Higher click through rates and properly optimized ads in a PPC campaign create a higher quality score. This reduces your cost per click and increases the impression your ads receive. The same principle applies to Twitter ads. High engagement rates will allow you to lower your bids and end up paying much less than other advertisers. Ads that have a low engagement rate will eventually stop serving. If Twitter feels that the ad isn’t relevant they will stop showing it and serve ads that are receiving engagement. They naturally want to show ads that are going to receive engagement and generate advertising revenue. If your ads start off strong and then you see your engagement level fall off you will want to refresh your ads with new creatives. Twitter wants to always show new ads every few days, so make sure you are adding new ones and pausing old ones every few days to ensure they keep running. 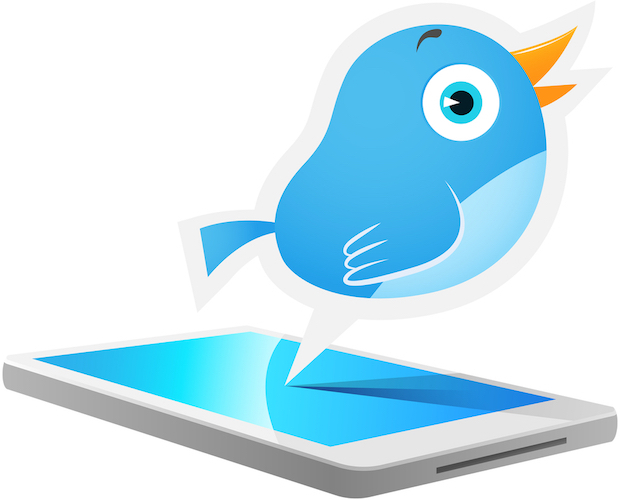 There are several options for generating leads on Twitter. In your advertising dashboard you will want to click on “Cards” under the “Creatives” menu. The two card options you will want to focus on are “Lead Generation” and “Website.” These options allow you to include an image with your add, giving you the best of both worlds -- text ad copy and a visual banner ad. The Lead Generation cards allow you to upload an image size of 800 X 200, while the Website cards can be 800 X 320. Lead Generation cards allow you to create a custom message and custom call-to-action button that when clicked, asks the user for permission to pass their name and email address over. When they agree their information is passed to your email marketing software and then the user is directed to a landing page or thank you page that you assign. This is a great way to build your email list and you know, with 100% certainty that the emails are all valid since Twitter is passing the email that the individual uses for his or her Twitter profile. Website cards just direct the user to a landing page URL and you have to use pre-defined call-to-action button text. There is less customization and you aren’t guaranteed an email address. Using this type of card will only result in a lead if the visitor converts on the landing page they are sent to. Are Website Cards or Lead Generation Cards More Effective? Both cards can be effective when used correctly. For example, if you are trying to build an email newsletter list you would want to use the Lead Generation cards, but if you were trying to get users to sign up for a free SaaS trial you would use a Website card and send them to a landing page where they could register for the trial. It is going to require some common sense along with testing to determine what works best for your business. Any time you start a new advertising campaign you have to be prepared to invest some money into testing. If you are unwilling to do this you aren’t going to be able to explore all options and then allocate your time, money and effort into the option that shows the best initial promise. For Website cards, you will need to install a tracking pixel on your thank you page that the people are directed to after they convert. To grab your tracking code you will want to click on “Conversion tracking” under the “Tools” menu. Click “Create new” and assign a name to the pixel and select the best option that describes the action/conversion type you are tracking. You will also want to make sure that you select the “Create a tailored audience” option. This will create a list of users that have already converted. When you scale your campaign you can then make sure those individuals are not marketed to in the future since they have already completed the conversion process. Make sure you insert the tracking pixel code in the HTML code of your thank you page, just before the closing tag. While Twitter Ads can deliver outstanding results, those results will differ depending on your business, your offers and how you build out your campaigns. Start small, test, and then continue to optimize and scale when you discover what works well for your particular business.